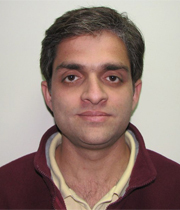 Sanjit got his PhD in electrical and computer engineering from Rutgers – The state university of New Jersey in 2011. He specializes in wireless communications and networks. His dissertation research was on safety messaging in autonomous vehicular networks. Currently, he is an Associate Professor at IIIT-Delhi. He is a part of the Wireless Systems Lab at IIIT. His research interests include enterprise wireless network optimization, vehicular networks, and mobile sensing and computing. After finishing his BTech from BIT-Mesra, he worked at Tata Consultancy Services, Hughes Software Systems, and Ubinetics India Pvt. Ltd. While pursuing his PhD he interned at Interdigital Communications and collaborated with Toyota InfoTechnology Center in the US. Optimization of Wireless Networks, Enterprise 802.11 (WiFi) networks, Vehicular Networks, Anomalous activity detection using mobile phones. Probability and Random Processes, Wireless Networks.